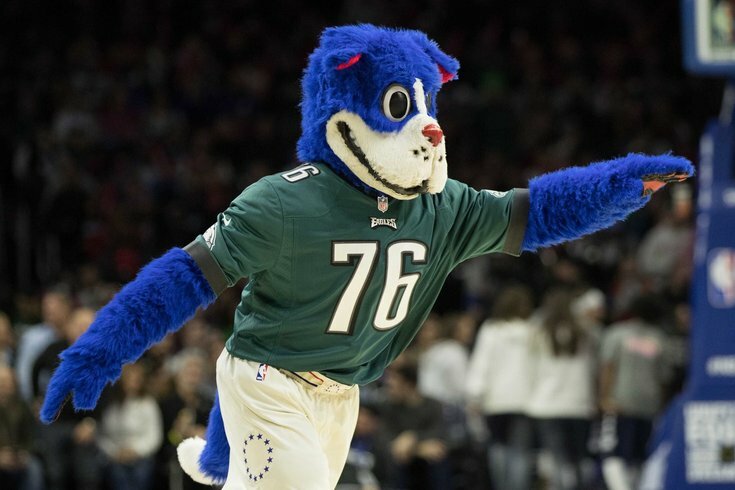 The Philadelphia 76ers mascot Franklin wears a Philadelphia Eagles shirt as he cheers on during the second half against the Miami Heat at Wells Fargo Center. The Eagles' season might be over, but after winning the first Super Bowl in franchise history you can bet these guys aren't going to disappear from the limelight anytime soon. And one of their fellow teams is stepping up to make sure they feel the love. Which Eagles players are skipping the honorary White House visit? Philadelphia's entire offensive line — Halapoulivaati Vaitai, Stefen Wisniewski, Jason Kelce, Brandon Brooks, Lane Johnson and the injured Jason Peters — will be on hand to the ring the ceremonial bell the Sixers roll out before every game. They have had a number of celebrities and local sports figures take part in it over the last couple seasons, but it will obviously be a special occasion with the newly-minted champs in the house. The love between the Sixers and Eagles is real, and the former embraced their peers with open arms in the lead-up to the Super Bowl. 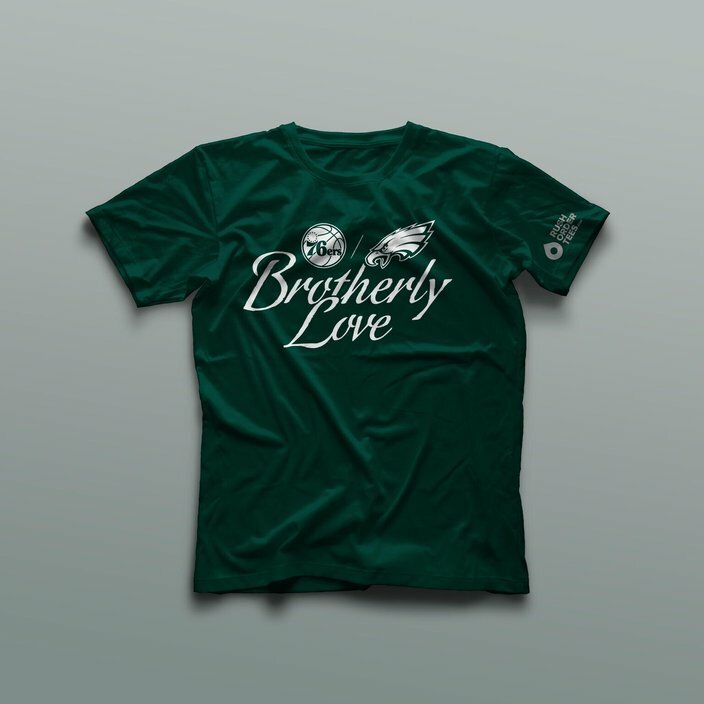 Luxury boxes and suites were lit up with Eagles green for every home game during Philadelphia's playoff run, and the Sixers gave out green "Brotherly Love" shirts prior to last Friday's game against the Miami Heat, which turned into a glorified Super Bowl pep rally. The Sixers, according to team personnel, expect there to be more than just the offensive line on hand at Tuesday night's game. Other players and front office personnel are anticipated as guests for the national TV game against the Washington Wizards, and the Sixers have several in-game celebrations of the team prepared to honor the Eagles. Fans can expect to see several videos throughout the evening, in addition to appearances from the Eagles' mascot, Swoop, and several Eagles cheerleaders. Sixers players have established friendships with a lot of the Eagles players, most notably Justin Anderson, who shares an alma mater with Eagles defenders Chris Long and Rodney McLeod. On the Monday following the Super Bowl, Anderson told reporters the Sixers want to use the Eagles' success through adversity as an inspiration for their own. Anything can happen. It just shows if you continue to work hard every day, you know those guys are all pieces of the puzzle. Sometimes it's hard to see where you want to be in a position where you're not the face of a team or the star of a team. Those guys came in collectively and they executed and played really well. How that translates to us is everybody's got to do their job. You've got to continue to work on your craft, and who knows where it will take you. The Sixers' matchup with Washington is an important one, as the Sixers will look to get back over .500 with a win over a conference rival.